Fayetteville, NC - are you ready for this? The Men that control all the Impact wrestlers in the ring will be at Ring Wars Carolina AGAIN! This time, Fayetteville, you get the pleasure of meeting The All-Time Greats Brian and Earl Hebner! Come and meet the Legendary Earl "Damn right I did" Hebner and Brian “Voted Best Ref " Hebner. You see them EVERY Thursday night on TNA IMPACT Wrestling. You will also see the RWC No Limitz Champion, Kris Nemesis, in action. The RWC Tag Team Champions, The Krayoz will be defending the titles along with the RWC World Heavyweight Champion, “Dirty” Hector Sanchez! I don't think Hangtyme is ready to give up right now! The AIWF Womens Champion, Mia Svensson will be taking on Alexis Parrish. Alexis has her eyes set on the Title so this should be a great match-up. Mia is pretty high right now coming of her title defense against the bigger and more powerful Lei D Tapa. Tapa seemed pretty upset at the loss and was heard around the locker room telling the Promoter “It ain’t over, not by a long shot!" Ladies and Gentlemen! It all goes down in Fayetteville NC! Doors open early for the Meet and Greet! 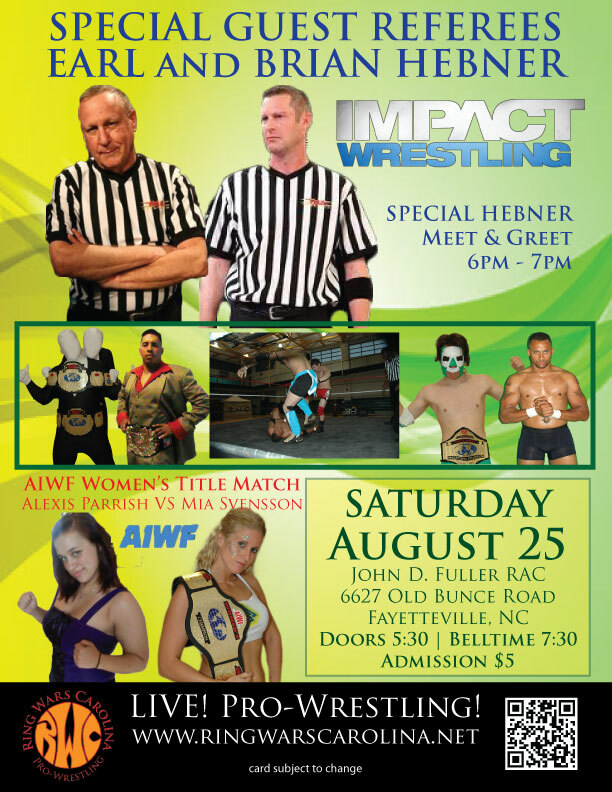 6pm to 7pm for the "Earl and Brian Hebner Autograph Party"